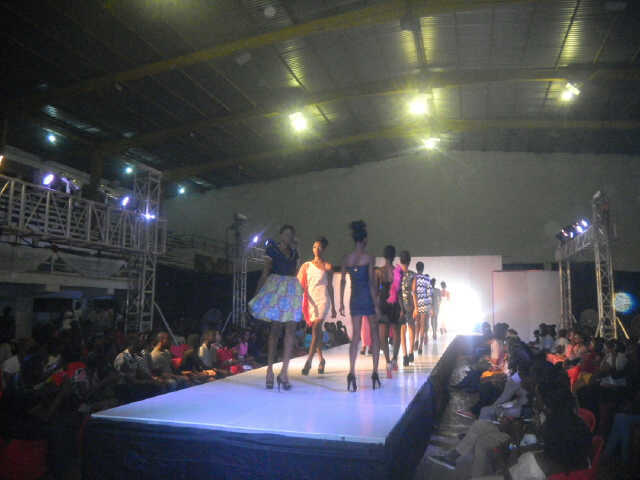 The first ever Nigerian Student Fashion and Design Week (NSFDW) took place on the 7th and 8th of July at the Indoor Sports Hall, University of Lagos. The show came about as a collaboration between BlackNBold Fashion House- the producers of numerous student fashion shows in Nigeria, Africa Fashion Week London, the producers of the biggest African Fashion Week in Europe and Mahogany International, world renowned producers of fashion weeks across the world. It was an event that showcased the works of designers- consisting of students, graduates, as well as aspiring designers from all over Nigeria. The aim of this event was basically to discover new talent and give opportunities to those that would not normally be able to afford to showcase at the Nigerian fashion weeks. According to Duvie- owner of Duvi collection, his aim of entering into NSFDW was to showcase his creativity. His collection which was themed 'Drama' was one of the most creatively artistic at the event. In an interview with another designer- Avore Style Company, she had this to say: "the theme of my collection is "Dress up". All my clothes are dresses for the African woman. My clothes are unique and you feel like yourself in them". It was a very exciting two day event and all the designers came out with their best designs and each day ended with a gala night show, where the designers, models and guests could unwind after a long day's work!